We describe methods for the design, fabrication, and experimental characterization of plasmonic photoconductive emitters, which offer two orders of magnitude higher terahertz power levels compared to conventional photoconductive emitters. 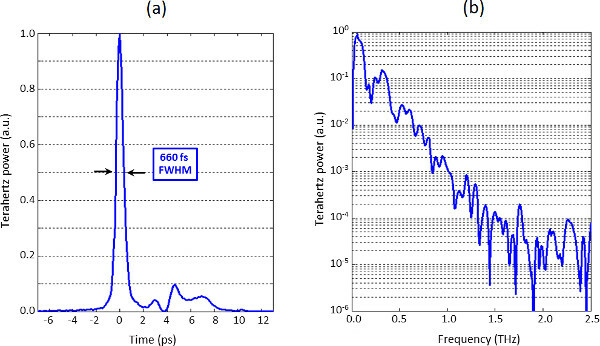 In this video article we present a detailed demonstration of a highly efficient method for generating terahertz waves. Our technique is based on photoconduction, which has been one of the most commonly used techniques for terahertz generation 1-8. Terahertz generation in a photoconductive emitter is achieved by pumping an ultrafast photoconductor with a pulsed or heterodyned laser illumination. The induced photocurrent, which follows the envelope of the pump laser, is routed to a terahertz radiating antenna connected to the photoconductor contact electrodes to generate terahertz radiation. Although the quantum efficiency of a photoconductive emitter can theoretically reach 100%, the relatively long transport path lengths of photo-generated carriers to the contact electrodes of conventional photoconductors have severely limited their quantum efficiency. Additionally, the carrier screening effect and thermal breakdown strictly limit the maximum output power of conventional photoconductive terahertz sources. To address the quantum efficiency limitations of conventional photoconductive terahertz emitters, we have developed a new photoconductive emitter concept which incorporates a plasmonic contact electrode configuration to offer high quantum-efficiency and ultrafast operation simultaneously. By using nano-scale plasmonic contact electrodes, we significantly reduce the average photo-generated carrier transport path to photoconductor contact electrodes compared to conventional photoconductors 9. Our method also allows increasing photoconductor active area without a considerable increase in the capacitive loading to the antenna, boosting the maximum terahertz radiation power by preventing the carrier screening effect and thermal breakdown at high optical pump powers. By incorporating plasmonic contact electrodes, we demonstrate enhancing the optical-to-terahertz power conversion efficiency of a conventional photoconductive terahertz emitter by a factor of 50 10. We present a novel photoconductive terahertz emitter that uses a plasmonic contact electrode configuration to enhance the optical-to-terahertz conversion efficiency by two orders of magnitude. Our technique addresses the most important limitations of conventional photoconductive terahertz emitters, namely low output power and poor power efficiency, which originate from the inherent tradeoff between high quantum efficiency and ultrafast operation of conventional photoconductors. One of the key novelties in our design that led to this leapfrog performance improvement is to design a contact electrode configuration that accumulates a large number of photo-generated carriers in close proximity to the contact electrodes, such that they can be collected within a sub-picosecond timescale. In other words, the tradeoff between photoconductor ultrafast operation and high quantum efficiency is mitigated by spatial manipulation of the photo-generated carriers. Plasmonic contact electrodes offer this unique capability by (1) allowing light confinement into nanoscale device active areas between the plasmonic electrodes (beyond diffraction limit), (2) extraordinary light enhancement at the metal contact and photo-absorbing semiconductor interface 10, 11. Another important attribute of our solution is that it accommodates large photoconductor active areas without a considerable increase in the parasitic loading to the terahertz radiating antenna. Utilizing large photoconductor active areas enable mitigating the carrier screening effect and thermal breakdown, which are the ultimate limitations for the maximum radiation power from conventional photoconductive emitters. This video article is concentrated on the unique attributes of our presented solution by describing the governing physics, numerical modeling, and experimental verification. We experimentally demonstrate 50 times higher terahertz powers from a plasmonic photoconductive emitter in comparison with a similar photoconductive emitter with non-plasmonic contact electrodes. Clean the semiconductor wafer by immersing in acetone (2 min) followed by isopropanol (2 min), and rinsing with deionized water (10 sec). Dry the sample with nitrogen and heat it on a hotplate at 115 °C for 90 sec to remove any remaining water. Spin MicroChem 950K PMMA A4 on the sample at 4,000 rpm for 45 sec. Pre-bake the resist on a hotplate at 180 °C for 3 min. Load the sample into an electron beam lithography tool (JEOL JBX-6300-FS). Expose the plasmonic grating pattern at a base dose around 650 μC/cm2, using a 100 kV acceleration voltage. Develop PMMA by immersing the sample in a MIBK:IPA 1:3 mixture for 90 sec. Immediately transfer the sample to a solution of pure isopropanol for 60 sec. Rinse the sample with deionized water for 10 sec and then dry the sample with nitrogen. Load the sample into a plasma stripper (YES-CV200RFS). Descum the sample using 30 W RF power at 30 °C with a 100 sccm O2 flow rate for 10 sec. Remove surface oxide by immersing in a HCl:H20 3:10 mixture for 30 sec. Immediately transfer the sample to a cascade rinse of deionized water for 4 min. Transfer the sample to a beaker of deionized water to minimize exposure to atmospheric oxygen before metal deposition. Take beaker containing the sample in deionized water to a metal evaporator (Denton SJ-20). Vent the chamber and then remove, dry, and load the sample into the chamber (these steps should be followed without interruption to prevent surface oxide formation on the sample). Pump the chamber to a pressure below 2x10-6 Torr. Deposit Ti/Au (50/450 Å). Vent the chamber and remove the sample. In order to lift-off the deposited metal, place the sample on a Teflon holder in a beaker of acetone, cover, and leave overnight. Uncover the beaker, place it in an ultrasonic agitator, and wait until all unwanted metal is removed (typically 30 sec). Clean the sample as in Steps 1.1.1 - 1.1.2. Load the sample in a plasma-enhanced chemical vapor deposition tool (GSI PECVD). Deposit 1500 Å of SiO2 at 200 °C. Open contact vias through SiO2. Spin on HMDS at 4,000 rpm for 30 sec. Spin on Megaposit SPR 220-3.0 photoresist at 4,000 rpm for 30 sec. Pre-bake the resist on a hotplate at 115 °C for 90 sec. Load the sample and mask plate into projection lithography stepper (GCA AutoStep 200). Align the sample and expose. Post-bake the exposed photoresist on a hotplate at 115 °C for 90 sec. Develop resist in AZ 300 MIF developer for 60 sec. Immediately move the sample to a cascade rinse of deionized water for 4 min. Dry the sample with nitrogen. Load the sample into a reactive ion etcher (LAM 9400). Etch SiO2 using a TCP RF power of 500 W, a Bias RF power of 100 W, 15 sccm of SF6-, 50 sccm of C4F8, 50 sccm of He, 50 sccm of Ar for 80 sec. Remove the bulk of the photoresist by placing the sample in acetone (5 min) followed by isopropanol (2 min). Rinse in deionized water (10 sec). Dry with nitrogen. Remove the residual photoresist by loading the sample in a plasma stripper (YES-CV200RFS). Remove the photoresist using 800 W RF power at 30 °C with a 100 sccm O2 flow rate for 5 min. Fabricate antennas and bias lines. Repeat Steps 1.3.1 - 1.3.6 to pattern antennas and bias lines. Repeat Steps 1.1.8 - 1.1.9 to remove surface oxide. Take the beaker containing the sample and deionized water to a metal evaporator (Denton SJ-20). Vent the chamber and then quickly remove, dry, and load the sample into the chamber. Pump the chamber to a pressure below 2x10-6 Torr. Deposit Ti/Au (10/4,000 Å). Repeat Step 1.1.13 to lift-off the deposited metal. Glue the edges of a 12 mm diameter hyper-hemispherical silicon lens to a 2 inch aluminum washer with 8 mm hole. Glue a PCB board with metal traces, to which one can easily solder, to the aluminum washer. Mount the fabricated plasmonic photoconductive terahertz emitter prototypes on the silicon lens using thin epoxy. Wire bond the device contact pads to a PCB board glued on the same aluminum washer. Solder wires to the metal traces on the PCB board. Connect device contact pads to a parametric analyzer (Hewlett Packard 4155A) using wires soldered to the corresponding pads of the PCB board for testing purposes. Place the aluminum washer carrying the plasmonic photoconductive terahertz emitter prototypes on a rotation mount and tightly focus the optical pump from a Ti:Sapphire mode-locked laser (MIRA 900D V10 XW OPT 110V) onto the active area of each device. Adjust the rotation mount such that the electric field of the optical pump is oriented for efficient excitation of surface plasmon waves (normal to the plasmonic gratings). Use the parametric analyzer to simultaneously apply bias voltages to each device and measure the induced electrical current in each device. Confirm the optimum optical pump alignment and polarization adjustment by maximizing the photocurrent of each device under test. Use an optical chopper (Thorlabs MC2000) to modulate the optical pump from the mode-locked pump laser incident on each device. Measure the output power of the plasmonic photoconductive terahertz emitter prototypes using a pyroelectric detector (Spectrum Detector, Inc. SPI-A-65 THz). Connect the output of the pyroelectric detector to a lock-in amplifier (Stanford Research Systems SR830) with the optical chopper's reference frequency to recover terahertz power data at low noise levels. Start with a Ti:Sapphire mode-locked laser and use a beam splitter to split the output of the mode-locked laser into a pump beam and a probe beam. Use an electrooptic modulator (Thorlabs EO-AM-NR-C2) to modulate the optical beam in the pump path. Focus the pump beam onto the active area of the photoconductive emitter under test to generate terahertz radiation. Collimate the generated terahertz beam using a first polyethylene spherical lens. Focus the collimated terahertz beam using a second polyethylene spherical lens. Before the focus of the terahertz beam, combine the collimated terahertz beam with the probe optical beam using an ITO coated glass filter. Place a 1 mm thick, <110> ZnTe crystal mounted on a rotation stage at the combined focus of the optical and terahertz beam. Insert a controllable optical delay line in the optical probe path by using a motorized linear stage (Thorlabs NRT100) to vary the time delay between the optical and terahertz pulses interacting inside the ZnTe crystal. Using a half-waveplate in the probe path, rotate the polarization of the optical probe to be at a 45° angle relative to the terahertz polarization direction. Use a quarter-waveplate after the ZnTe crystal, convert the optical beam polarization into circular polarization. Split the circularly polarized optical beam into two branches by a Wollaston prism. Measure the optical beam power in each branch using two balanced detectors connected to a lock-in amplifier. Connect the motorized delay line and lock-in amplifier to a computer. Write a Matlab script to iteratively move the position of the motorized delay line, pause, and read the signal magnitude from the lock-in amplifier. Convert the stage position to the time domain, through dividing the total optical delay length by the speed of light, followed by a discreet Fourier transform (using Matlab) to obtain the frequency domain data. To demonstrate the potential of plasmonic electrodes for terahertz power enhancement, we fabricated two terahertz emitters: a conventional (Figure 1a) and plasmonic (Figure 1b) photoconductive emitter incorporating plasmonic contact electrodes to reduce carrier transport times to contact electrodes. Both designs consist of an ultrafast photoconductor with 20 μm gap between anode and cathode contacts, connected to a 60 μm long bowtie antenna with maximum and minimum widths of 100 μm and 30 μm, respectively, fabricated on the same LT-GaAs substrate. The plasmonic photoconductive emitter incorporates two nanoscale plasmonic contact gratings into the input port of the bowtie antenna. 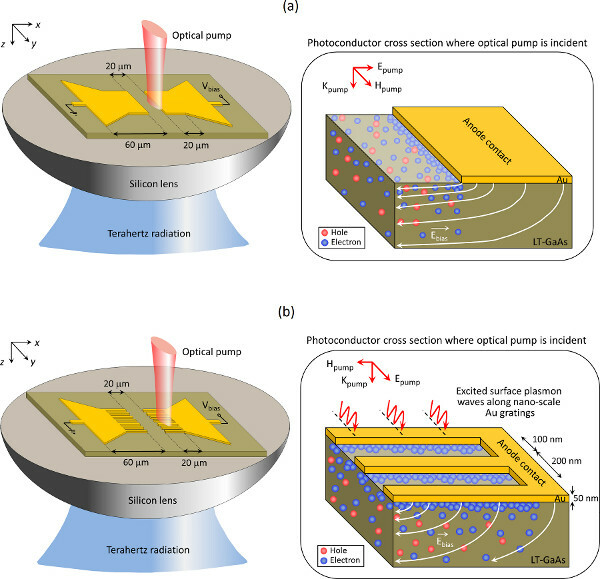 The design strategy for the optimum plasmonic contact electrode configuration is maximizing the optical pump transmission into the photo-absorbing substrate while minimizing the spacing between plasmonic electrodes to minimize the average photo-generated carrier transport path length to the contact electrodes. We use a multi-physics finite-element solver (COMSOL) to estimate the response of the photoconductors with the designed plasmonic contact electrodes to an incident optical pump. For this purpose, the photo-generated carrier density is derived from the calculated optical intensity in the photo-absorbing substrate and combined with the bias electric field data in the classical drift-diffusion model to calculate the induced photocurrent 9. Metals with strong plasmonic properties at the pump optical wavelength are preferred, since they enable tight confinement of the optical pump at the metal interface and, thus, offer short photo-generated carrier transport path lengths to the contact electrodes. For the proof-of-concept plasmonic photoconductive emitter, we designed a plasmonic grating with 100 nm Au width, 100 nm spacing, and 50 nm height, which allows transmission of more than 70% of an 800 nm optical pump through the nanoscale gratings into the photo-absorbing substrate 11, 12. The incident optical pump from a Ti:sapphire laser with a central wavelength of 800 nm, 76 MHz repetition rate, and 200 fsec pulse width was tightly focused onto each fabricated device (Figure 2a) and positioned near the anode contact electrode to maximize the radiated power 13-15. To maximize the radiated power for the conventional photoconductive emitter, the optical electric field was oriented to span across the gap between the anode and cathode contact electrodes. For the plasmonic photoconductive emitter, the electric field was oriented perpendicular to the metal gratings. The generated terahertz power from each photoconductive emitter was measured using a pyroelectric detector. Figure 2b shows the measured terahertz radiation from the plasmonic and conventional terahertz emitters, electrically biased at 40 V, under various optical pump powers. The inset curve shows the corresponding photocurrent. 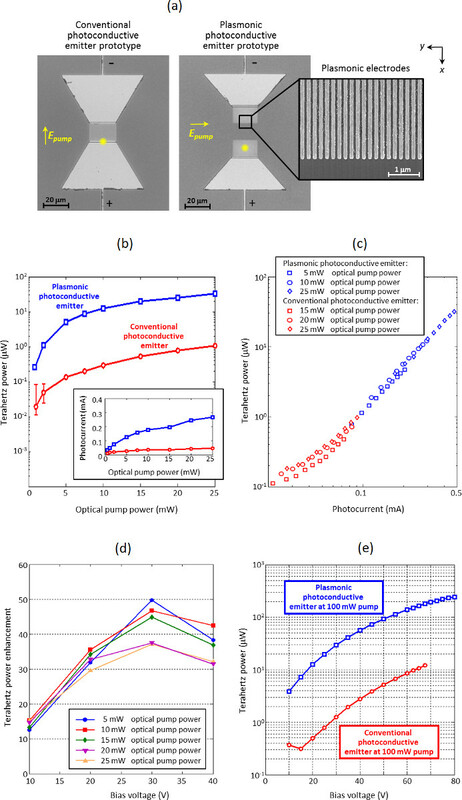 A radiation power enhancement of more than 33 was observed from the plasmonic photoconductive emitter in the 0 - 25 mW optical pump power range. This significant radiation power enhancement is due to the higher photocurrent levels generated when employing plasmonic contact electrodes. Figure 2c shows the measured terahertz radiation versus collected photocurrent for the plasmonic and conventional terahertz emitters. The data represented in the plot includes various bias voltages (10 - 40 V) under various optical pump powers (5 - 25 mW). The data points are all curve-fitted to the same line with a slope of 2, confirming the quadratic dependence of the radiation power on the induced photocurrent and the fact that all other operational conditions (including antenna specifications) are the same for the conventional and plasmonic photoconductive emitter prototypes. 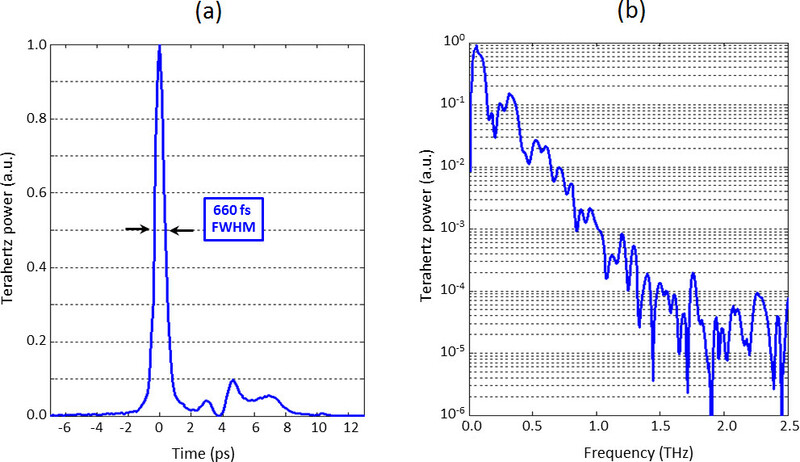 Figure 2d shows the terahertz power enhancement factor defined as the ratio of the terahertz power emitted by the plasmonic terahertz emitter to the conventional terahertz emitter. At low optical pump power levels and a bias voltage of 30 V, output power enhancement factors up to 50 are observed. The enhancement factor decreases slightly at higher optical pump power levels and higher bias voltages. This can be explained by the carrier screening effect, which should affect the plasmonic photoconductor more than the conventional photoconductor, since it is generating more photocurrent and separating a larger number of electron-hole pairs. Finally, the maximum terahertz power measured from the plasmonic and conventional terahertz emitters under a 100 mW optical pump (Figure 2e). The bias voltage of each device is increased until the point of device failure. At maximum, the plasmonic photoconductive emitter produced an average power of 250 μW, compared to the 12 μW of the conventional photoconductive emitter 10. Figure 1. Schematic diagram and operation concept of photoconductive terahertz emitters. (a) A conventional photoconductive terahertz emitter. (b) A plasmonic photoconductive terahertz emitter incorporating plasmonic contact electrodes. Click here to view larger figure. Figure 2. Comparison of conventional and plasmonic photoconductive terahertz emitters 10. (a) Fabricated device images. (b) Measured terahertz radiation from the plasmonic and conventional terahertz emitters, electrically biased at 40 V, under various optical pump powers. The inset curve shows the corresponding photocurrent. (c) Measured terahertz radiation versus collected photocurrent for the plasmonic and conventional terahertz emitters. The data represented in the plot includes various bias voltages (10 - 40 V) under various optical pump powers (5 - 25 mW). (d) Relative terahertz power enhancement defined as the ratio of the terahertz power emitted by the plasmonic terahertz emitter to the conventional terahertz emitter. (e) Maximum terahertz power measured from the plasmonic and conventional terahertz emitters under a 100 mW optical pump. The bias voltage of each device is increased until the point of device failure. At maximum, the plasmonic photoconductive emitter produced an average power of 250 μW, compared to the 12 μW of the conventional photoconductive emitter. Click here to view larger figure. Figure 3. Spectral characteristics of the plasmonic photoconductive emitter radiation 10. Radiation spectrum is measured in response to a 200 fsec optical pulse from the mode-locked Ti:sapphire laser with 800 nm central wavelength and 76 MHz repetition rate in a time-domain terahertz spectroscopy setup with electro-optic detection. (a) Radiated power in the time domain. (b) Radiated power in the frequency domain. The observed radiation peaks around 0.35 THz and 0.55 THz are associated with the resonance peaks of the employed bowtie antenna, and the radiation peak around 0.1 THz is associated with the resonance peak of the dipole antenna formed by the bowtie antenna bias lines. Click here to view larger figure. In this video article, we present a novel photoconductive terahertz generation technique that uses a plasmonic contact electrode configuration to enhance the optical-to-terahertz conversion efficiency by two orders of magnitude. The significant increase in the terahertz radiation power from the presented plasmonic photoconductive emitters is very valuable for future high-sensitivity terahertz imaging, spectroscopy and spectrometry systems used for advanced chemical identification, medical imaging, biological sensing, astronomy, atmospheric sensing, security screening, and material characterization. The focus of this video article has been the demonstration of the impact of plasmonic electrodes in enhancing the induced photocurrent in ultrafast photoconductors and the radiated terahertz power from photoconductive terahertz emitters. Thus, the choice of the photoconductive emitter architecture, terahertz radiating antenna, and bias feed in our demonstration has been arbitrary, and the enhancement concept can be similarly applied to enhance the radiation power from photoconductive terahertz emitters with a variety of terahertz antennas with and without interdigitated contact electrodes as well as large-area photoconductive terahertz emitters in both pulsed and continuous-wave operation. In this regard, the output power of our prototype devices can be further enhanced through use of resonance cavities 3, 16, large device active areas 17-22, and antennas with higher radiation resistance and bandwidth 23, 24. Moreover, the described quantum efficiency enhancement mechanism in plasmonic photoconductors can be used to enhance the responsivity and detection sensitivity of photoconductive terahertz detectors, as well 25-27. It should be noted that the most critical step for implementing high performance plasmonic photoconductive terahertz emitters is patterning the plasmonic contact electrodes. On one hand, higher optical pump absorption and, thus, higher optical-to-terahertz conversion efficiencies can be achieved by use of higher aspect-ratio plasmonic contact electrodes. On the other hand, lifting off thick metallic features with nano-scale feature sizes is challenging since it requires thick resist layers and, therefore, the highest aspect ratio of the plasmonic contact electrodes is limited to the resolution of existing electron-beam lithography tools. We believe that our work will evolve in the near future to push the optical-to-terahertz conversion efficiency of plasmonic photoconductive emitters by more than three orders of magnitude. In this regard, the use of high aspect ratio plasmonic contact electrodes embedded inside the photo-absorbing semiconductor 28-30 allows ultrafast transport of the majority of photocarriers to the photoconductor contact electrodes and their efficient contribution to terahertz generation. Use of high aspect ratio plasmonic contact electrodes embedded inside the photo-absorbing semiconductor also eliminates the need for using short carrier lifetime semiconductors, which are used for suppressing the DC current of photoconductive emitters (in general) and for preventing undesired destructive interferences in continuous-wave photoconductive emitters (in specific). Eliminating the need for using short carrier lifetime semiconductors, which have lower carrier mobilities and thermal conductivities 31 compared to high quality crystalline semiconductors, would have an important impact on future high power and high efficiency photoconductive terahertz emitters. It could also lead to a new generation of photoconductive terahertz emitters based on photo-absorbing semiconductors with unique functionalities (e.g. Graphene-based photoconductive emitters that benefit from superior carrier mobilities or GaN-based photoconductive emitters that benefit from superior thermal conductivity). The authors would like to thank Picometrix for providing the LT-GaAs substrate and gratefully acknowledge the financial support from Michigan Space Grant Consortium, DARPA Young Faculty Award managed by Dr. John Albrecht (contract # N66001-10-1-4027), NSF CAREER Award managed by Dr. Samir El-Ghazaly (contract # N00014-11-1-0096), ONR Young Investigator Award managed by Dr. Paul Maki (contract # N00014-12-1-0947), and ARO Young Investigator Award managed by Dr. Dev Palmer (contract # W911NF-12-1-0253).